by Dan Winter. He will discuss HOW they cohere (extract energy from) the vacuum, and produce bio-active fields for growth and regeneration, and how they can produce propulsion. YouTube link at the bottom. Cold plasma is a name for the 'fire that does not consume'. 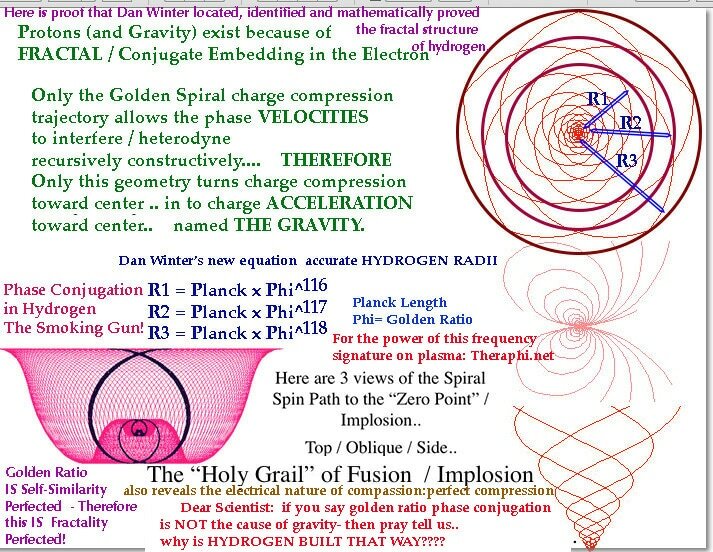 Cold Fusion is a name for a centripetal non-destructive compression - not requiring high heat. Implosion is a name for non-destructive compression, which is a vortex that does not produce heat (destructive interference). 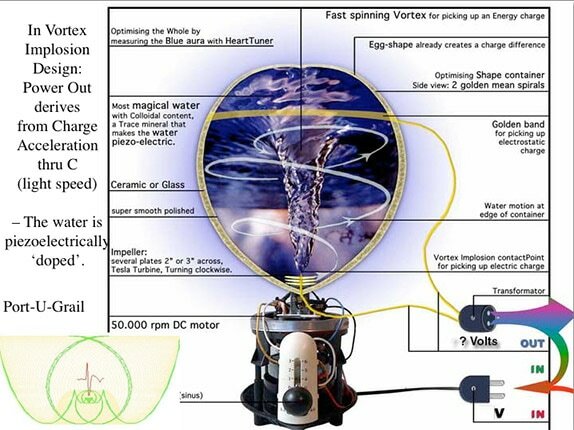 Victor Schauberger's famous piezo water vortex generator was a practical way to generate electric power from the vacuum, with a conjugate vortex. 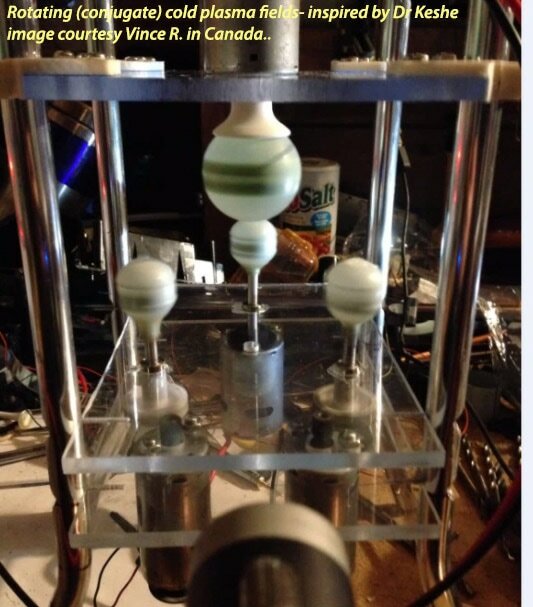 Importantly it is well reported that the key to knowing WHEN the piezo water implosive vortex was about to begin generating electric power from the vacuum was when it SPONTANEOUSLY BEGAN GETTING COLDER. Sadly, although physics is very accustomed to dealing with plasma fields, the physics community is very new to working with plasma fields which do not require high heat ('cold' plasma). From an engineering perspective - a plasma field could be described as a cloud of charge, which has been released from atoms electron shells, usually - BUT not always - by high heat. If there is a trigger, or seed, which is centripetal enough at center, THEN this cloud of charge could be distributed efficiently WITHOUT high heat. Interestingly this is also an introduction to how biology maintains the cloud of charge you call your aura (clearly a bioactive field) WITHOUT high heat. YOU are a flame that does not consume (well, maybe you eat stuff, but at least your inner fire does not burn you... usually). ​The physics community is quite clear that the universe is comprised of 99.99% plasma. SO we should get better at knowing how plasma is distributed. Hint: perfect distribution of charge (the holy grail of everything from immortality to cold fusion) is precisely the problem which FRACTALITY (phase conjugate wave mechanics) solves. Physics agrees that plasma science is key to fusion and vacuum energy. Wiki says: 'Plasma is loosely described as an electrically neutral medium of unbound positive and negative particles'. The tricky part is what allows these positive and negative 'particles' to be 'unbound'. What holds the cloud of charge - or plasma field - together??? It is perhaps not very helpful to say this part is 'matter', and this part (the plasma) is 'not matter' (as in non-material)... Because, serious science is clear, matter is MADE of a cloud of charge, which has been compressed enough to store the inertia, which is our ONLY definition for mass. So, emphasizing that the plasma field is 'non-material' would simply be evading the question of how it works. In order to get to the 'heart of the matter' (or non-matter) of how the unified field is working, rather than engage in the schizophrenic dichotomy of matter vs non-matter, we must deal with the nature of the substrate which makes everything: the nature of the vacuum and it’s energy itself: which is 'a cloud of charge' or... the ether. When we say that plasma is a 'cloud of charge' intelligent people should then ask: what is charge? After a bit of study you learn that unfortunately physics does not seem to have an answer to this question. Here is my answer to the question: what is charge? The universal vacuum behaves like a universal compressible liquid which stores inertia in its waves. The nature of the compression and rare-faction in that liquid ('ether') is called plus and minus charge. Thus the universal compressible media, which comprises the vacuum, sometimes called 'ether', has an inertia storing quality of compression versus rarefaction; which is the origin of charge (yin and yang). That stored inertia which rotating charge gyroscopically creates in the vacuum is called mass. The interval created by that rotation is called time. Charge rotation is the cause of mass and time. So when we say space/time is bent or warped, we simply mean the matrix or nodes of charge interference. This is important because we see that the centripetal (gravity making) nodes in space time are always created by conjugate fractality (Not only is this why gravity exists, this is also why my new book exists!). Fractal fields, the cause of gravity, produce acceleration of charge toward center from fractal compression of charge. That acceleration of charge toward center defines the experience we call gravity. This is due to the fact that golden ratio - fractal - phase conjugate - charge wave interference, produces recursive phase velocity constructive interference. Only golden ratio / phase conjugate wave interference allows recursive interference (arithmetic and geometric wave progression) to be non-destructive. As the phase velocities constructively interfere, a portion of the charge being compressed experiences acceleration toward center (for example in the golden ratio hydrogen electron shells, see my equation for hydrogen radii). This is the reason gravity exists. This will also become important later in this article when we explain why rotating phase conjugate plasmas CREATE propulsion. Understanding how certain symmetries - we call fractal or phase conjugate - create this centripetal force is KEY to what we are about to teach about cold plasma. The reason charge fields can be held together without heat is that centripetal seed of wave symmetry at their center. This then introduces the role of MONO ATOMICS in creating cold plasma fields (including very useful inspirations from Dr Keshe). Dr Keshe pioneered systems (caustic liquids) which allow critical temperatures to release mono-atoms from the surface of metals (from copper plate or wire for example). Early discussions believed the primary mono-atoms were carbon mono-atomics. (We are setting up lab tests now on the produced monoatomics). 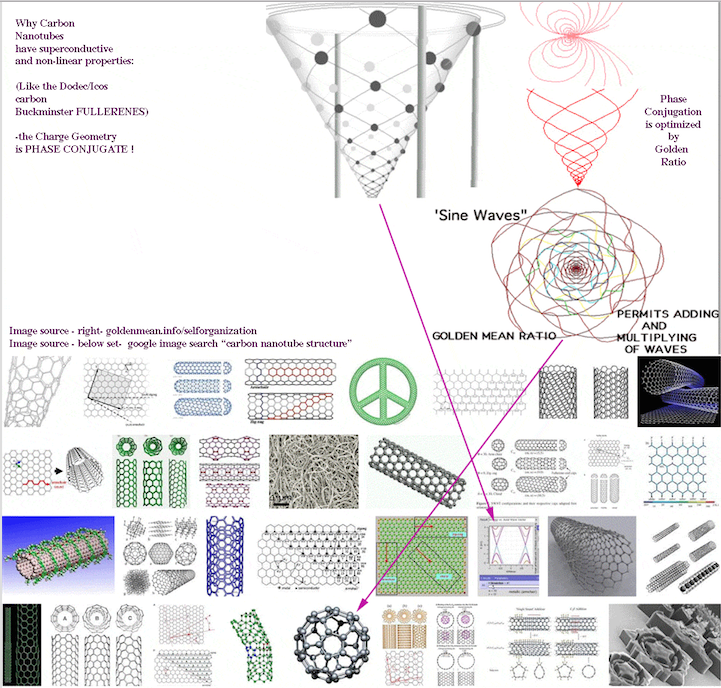 We know that carbon monoatomic structure is a conjugator (fractal / implosive) due to its FULLERENE geometry. The carbon nano-geometry of these FULLERENES became for a long time- the MOST STUDIED unusual chemical material in history. The analog to the tight electron collapse enabled by FULLERENES exists in today’s excitement over MONO-ATOM graphene sheets of carbon. Electron conductivity is largely a boundary layer quantum wave phenomenon. This means for example in a carbon nano-tube, that if the nano-tube DIAMETER is a correct exact multiple of the electron wave LENGTH then a superconductive WAVEGUIDE tube for charge will result. The reason so many chemists devoted their lives to these FULLERENE structures was largely because of the unusual electrical quality which came from what you could put in the MIDDLE! Carbon nano-materials - like FULLERENES - have a classic DODEC/ICOSA recursive symmetry structure. This places their electrical qualities squarely in the center of the principle of fractal phase conjugators, which is the subject of my book. To understand how the fullerene carbon mono geometry encourages non-destructive charge collapse (fusion related phenomenon) we encourage you to order my Star Mother kit. The ability to create unusual and useful qualities from FULLERENES (carbon nano material) came from their ICOSA/DODECA (conjugate) electrical quality. 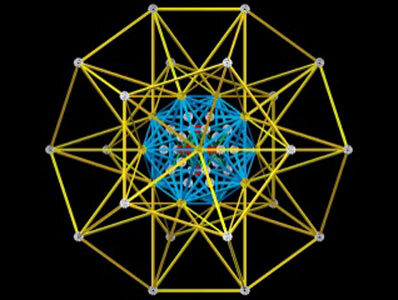 This is also illustrated by the same electrical DODECA/ICOSA geometry which is created when WATER molecules also take this unique and powerful geometry. These are called CLATHRATE cages- and they account for some of the most ordered and negentropic (healing) types of water structure. A good example being the way Pat Flanagan used the clathrate water molecule geometry to then hold (the also implosive/conjugator) mono-atomic hydrogen, to make his famous (anti-oxidant) MICROHYDRIN. Hydrogen we know is implosive and conjugate by its golden ratio geometry. When you put a (conjugator like) hydrogen mono-atom INSIDE the longer wave phase conjugate - WATER CLATHRATE - you get broad spectrum conjugate- NEGENTROPY. ​See illustration: consider how the JITTERBUG collapse geometry - ICOSA to CUBE-OCTA can describe a non-destructive COLLAPSE PATH FOR CHARGE, also as a MECHANISM OF SUPERCONDUCTIVITY. The point here is that mono-atomic materials create centripetal forces in the vacuum due to their conjugate / implosive / fractal structure. This is nowhere better illustrated than by the famous extremely large field effects created by mono-atomic gold. Laurence Gardner usefully discusses the physics of the HUGE charge or plasma field created by mono-atomic gold (ormes). The physics of HOW the mono-atom stabilizes such a large outreaching plasma or charge field is introduced by the work of both Dr Keshe and David Hudson who have used it to describe the atomic process by which the atom BECOMES monoatomic. They say it TURNS INSIDE OUT (rather like pop-corn). This is surely a good introduction to the implosion physics of perfect charge collapse- which is the subject of almost my entire life work. During implosive collapse of the charge field the physics of phase conjugation (negentropy and self-organization) predict that the superluminal component of the charge field that then again RADIATES from the center will have been stabilized into max coherence (called conjugate). This is the very essence of what phase conjugation IS (in optics for example): self organizing to eliminate all wave components not precisely in phase. This is the nature of how death CAN work, and how rejuvenation and age reversal happen in phase conjugate - plasma or charge fields. We urge you to look at the picture of our PRIORE phase conjugate plasma rejuvenator at www.fractalfield.com/fractalspacetime , and the detailed pdfs about it at www.goldenmean.info/phaseconjugate . It is important that you SEE the comparison - between the phase conjugate time reversing plasma of PRIORE - and the way DR KESHE plasma is creating rejuvenation and healing. "Everything Centripetal, Negentropic, Gravity Producing, or ALIVE becomes so by BEING a (perfect wave fractal) PHASE CONJUGATE PUMP WAVE!" A phase conjugater causes waveforms to converge to an implosive centrepoint which has the dimensions of the Planck Constant. Phase conjugate collapse is the source of all Life. The Planck length and Time are also the universal musical key signature. It also defines the mass and radius ratios of the Proton and Electron. This is the alchemy of deep physics, the key to isotope transitions and implosion and fusion. Bioactive fields also attract trapped 'ghosts'. Presences feel 'cool' because they are imploding charge and consuming heat in these spots where there is natural charge compression. An extra boost from a 'thought or intent' or other 'space clearing' can create a coherent charge that will dissolve and free the energy. Parasitic entities in the aura, and originating disease symptoms can also be cleared by phase conjugate fields. All parasitic energy/material is destroyed by perfect charge distribution, shareable waves. Anything selfish, localized or impure is re-sorted. Heat and disorder are eliminated. Pain is the body electrically calling for restored charge. Compression is implosive and holds the bio-field together, and so a centripetal mass of conjugate plasma can obviously relieve pain - pain is the charge that is bleeding, it's fractality got broken. ​Remember that the MOMENT I realized I knew HOW PRIORE's device healed thousands of cancers, documented by the French government, was when I found out my new central equation for all idealized phase conjugate negentropy PREDICTED THE FREQUENCIES PRIORE USED. PRIORE's investigations for ideal healing charge harmonics were an outgrowth of the Golden Ratio discoveries of the LAKHOVSKY Oscillator (rejuvenation / healing field generator), and the work of RIFE). 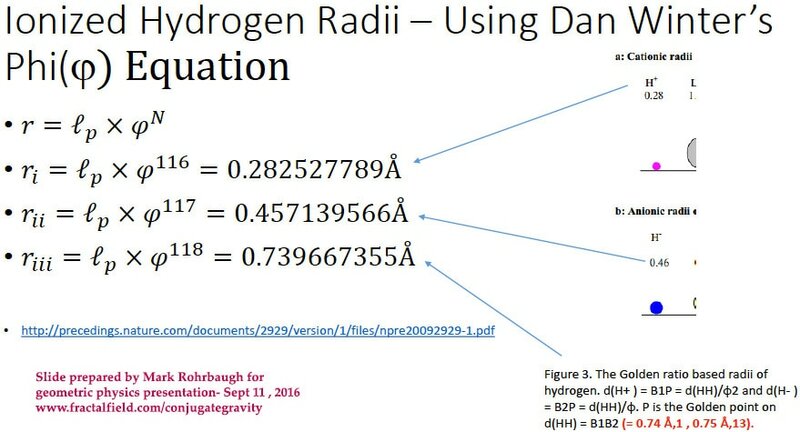 My equation also predicted the frequencies Elizabeth Rauscher used in her FDA trials showing magnetic frequencies that reduced pain. THIS is why I am confident I can use my equation to optimize the centripetal PLASMA FIELDS working with DR KESHE. 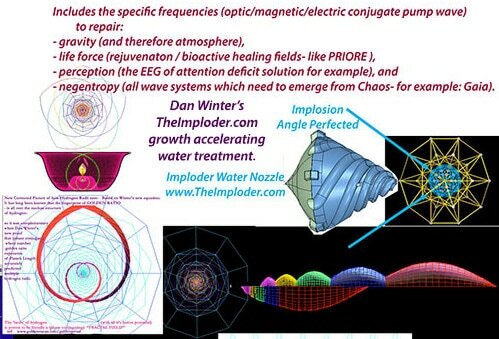 ​Our TheImploder.com technology produces a bioactive field (in water) by phase conjugate hydrodynamic vortex (in the nozzle). This centripetal piezo field around the nozzle is so powerful (especially if the water is hard/ mineral rich / piezo ) that plants near the nozzle grow faster even if not fed the water processed by it. We complement that centripetal force and solubility effect with centripetal super magnetics. The centripetal (opposing correct polarity super magnets) magnetics act like the field of a permanent magnet motor on the rapidly spinning water molecules exiting our perfect vortex nozzle. We suggest the comparison with cold plasma fields being bioactive. 2. cold plasma- to create BIOACTIVE FIELDS- to heal, accelerate growth, and grow living biologic materials. 3. cold plasma - to create PROPULSION, ARTIFICIAL GRAVITY , and / or acceleration. Clearly - the nature of phase conjugation to make the plasma field cohere WITHOUT HEAT is central to all these applications of cold plasma. Regarding, 1. the energy source applications. We have clearly measured with the help of Dr Keshe's friends the generation of modest voltages immediately on the surface of the deposits of the monoatomics. The trials we did here (with Brett's help) showed up to 1 volt differential on the monoatomic coatings (we did trials on the surface of copper wire, and copper plate, and magnesium plate). These modest power outputs from dielectrics relate to our capacitive battery projects. The key to a super-capacitor battery project is to realize that IF the dielectric constant of the capacitors 'insulator' layer is high enough THEN it by definition is gathering charge/energy from the vacuum. Let me explain. Dielectric constant is a name for how efficiently the capacitor, formed by the efficient insulator sandwich layer, 'rings' like a bell. This refers to the fact that the way you measure dielectric constant IS like ringing a bell. You 'hit' the capacitor- (the bell) - with a pressure (called voltage)- then you step back- and you measure how well it 'rings' (the amplitude of its resonance). SO, for dielectric constants above a certain minimum (like many barium titanate phase conjugate dielectrics) this clearly implies a condition where the bell can ring back with more energy than you provided when you hit the bell! This is part of the implication for over-unity in certain super-capacitor batteries. Effectively the vacuum coherence of the capacitor is generated because the dielectric material in the insulator of the capacitor is SO resonant TO the vacuum that the vacuum energy is 'sucked' in. This means that clearly one of the important steps of CREATING the mono-atomics is to surround them with high dielectric materials (certain ceramics for example - see Pyraphi.com ) AND a way to measure success is to optimize for higher dielectric constant in the resultant monoatomic layers and liquids (Keshe's materials for example). The concept is not so extreme to understand. ALL agree that the vacuum contains huge amount of (resonant) energy. The vacuum does have specific known resonant coupling frequencies. The vacuum is set to provide resonance inertia ('free' energy) to any location which is more implosive, or conjugate TO that resonance. At the link above we claim, by measurement, that this ability to cohere the vacuum by implosive capacitance in fact DEFINES LIFE itself! (We are the first to define WHERE the measureable output voltage of chicken eggs comes from). Here the claim is that the mechanism of vacuum coherence (for the crystal battery) is that, during the formation of the capacitive dielectric, "QUANTUM DOTS" occur. This is a reference, not unlike postulating the formation of 'little black holes", which is much the same as saying IMPLOSION points. I consider the wave physics of coherence nodes (little black holes) to be more descriptive language than 'quantum dots'. The point is that no matter how you language the phenomenon (Nassim for example, on black holes) that implosive nodes in the vacuum are the mechanism to cohere the vacuum for energy. The above may suggest why modest voltages (and milli-watts) are available to monoatomic coatings (Keshe's et al). BUT how are higher power levels acheived? Dr Keshe has pioneered a technique to supersaturate and purify and concentrate liquids to semi-liquids as monoatomic 'soup' (GANS). In one series of experiments when the monoatomic 'soup' liquid saturates the insulator (tissue for example) between capacitive plates coated with mono-atomics, then much high power levels are claimed. Again we suggest the dielectric constant of these saturations of monatomic liquids on insulator tissue for capacitance must be VERY high. I hypothesize that the spiral angle on the generated vortex in the plasma- must and can be optimized according to the following spiral strip - symmetry physics. Noting the Cold Plasma Field used by Dr Keshe is rotated to create propulsion the point here is that our physics model SPECIFICALLY PREDICTS THAT ROTATING A PHASE CONJUGATE FIELD (like the wave symmetry which holds the cold plasma together) WOULD PRODUCE PROPULSION. The Image to understand WHY rotating phase conjugate fields produce propulsion/ acceleration- is like a (plasma) spiral cone (of charge) screwing its way through the vacuum. SO, in summary: when the plasma toroids are rotated in cube-octa symmetry, this precisely corresponds to the shape of 4 wave mixing in phase conjugate optics. This means that the correct balancing of the centripetal cold plasma fields (Keshe's technique) - will correspond to the known physics of perfecting phase conjugate wave mechanics (known in optics for example). We have discussed how to optimize the bioactive / regeneration quality of plasma fields (PRIORE et al), so the only part of the 4 qualities of cold plasma applications we have not discussed here is the instantaneous communication. For this we refer to the phase conjugate model of perception chapter in my new book. Note that the longitudinal component of the brainwaves generated in that model (for peak perception) are specifically superluminal. This means the bliss experiencing human brain (phase conjugate and longitudinal generating EEG - described there) are precisely A COLD PLASMA SUPERLUMINAL COMMUNICATOR.